The Emoluments of Mars: Dork's Head? There's been some discussion on the darkmission blog about the image that Richard Hoagland calls "Data's Head". This is a rock inside 'Shorty' crater, Station 4 of EVA2, Apollo 17 (the final moon mission). The rock is skull-sized and has a superficial resemblance to a face of some kind. Hoagland maintains — on the basis of no evidence whatsoever other than his own intuition — that it is in fact a replica of the head of the robot C3PO from the Hollywood movie "Star Wars", made in 1977. Superficial resemblance is good enough for the authors, it seems. Mike Bara wrote on 22nd May "It's there (or it was there before they retrieved it), it looks like a head, it's the right size for a head, it looks like C3-PO's head. Period." According to Hoagland, an ancient lunar civilization anticipated the imagination of a 1970s special effects designer (Tony Dyson) and created a similar robot. Also according to Hoagland, either of the two Apollo 17 astronauts "could have" descended into the crater and retrieved this rock. In the Introduction to "Dark Mission", Hoagland goes further than the "could have" position and asserts that Apollo astronauts actually did bring back artifacts of the lunar civilization "for highly classified efforts at back engineering" [sic, he means reverse engineering]. Mike Bara conceded on an internet discussion in December 2007 that neither he nor Hoagland has any actual evidence to support this astoundingly bold claim. The fact is that the Apollo 17 astronauts could not have retrieved this rock, for the following reasons. 1. It cannot be recognized as being "face-like" with the unaided human eye from the position the astronauts were in, at the crater rim. This was their view, as recorded by the hand-held Hasselblad camera. 2. 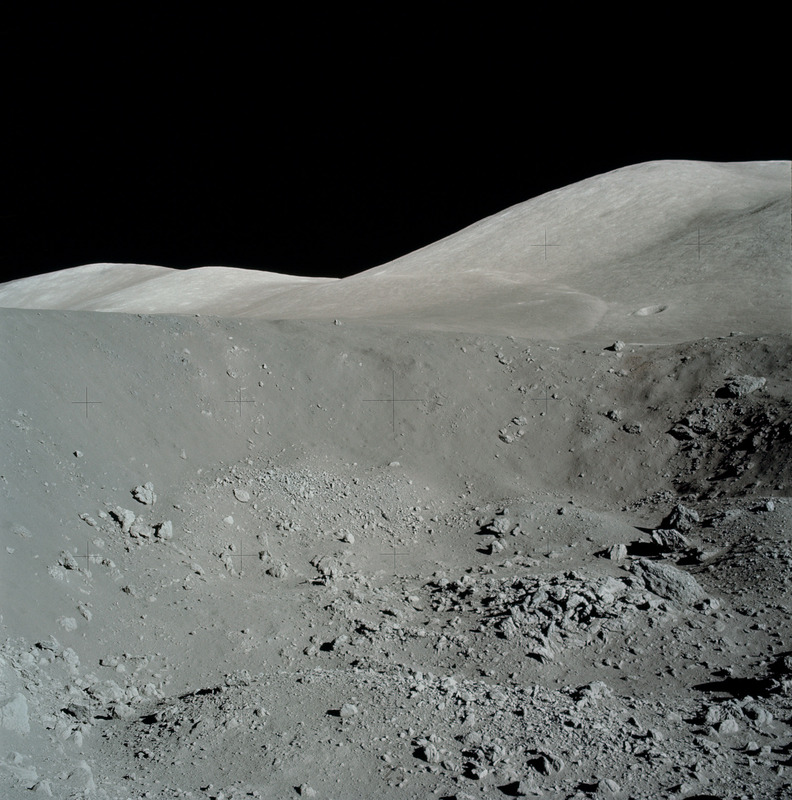 They had no means of descending the steep side of the crater — not to mention getting back up, carrying a rather heavy object even allowing for reduced lunar gravity. 3. Even if they had wished to do so, they would undoubtedly have been forbidden to by Mission Control. The EVA was already running late, and the transcript shows clearly that Mission Control was constantly reminding them of walk-back constraints at this station. 4. No discussion of this is heard on the tapes of this station. It's inconceivable that the astronauts would have contemplated such a risky venture without discussion. It's impossible that such discussion was edited out because this was happening on live TV all across Planet Earth. 5. They had no means of picking up a skull-sized rock. The hand-held scoop was sized for "fist-sized" rocks only, and the rake was completely inadequate (see pp 52-54 here). It is not possible to bend down and pick up such a rock by hand when wearing the lunar spacesuit. In addition, the "Data's Head" image is suspect. In the book, the authors write vaguely that it was arrived at by "processing and color enhancement" from the Hasselblad frame. What exactly does "processing and color enhancement" mean in this context? Mike Bara has written twice that this process can be repeated by anyone. When I asked for details of the "processing and color enhancement" so that I might attempt to repeat it, Bara went into his "scorn and insult" mode and wrote (May 22nd) that "you don't know anything about how images are processed." I wrote in reply that I was not going to comment on my level of expertise in image processing for the simple reason that it was beside the point. On May 28th, marsandro wrote "Okay. So...the point is...?" Mike Bara's wishful use of the word "Period" on May 22nd makes it clear that superficial resemblance is all the evidence he needs to draw his conclusion, and no further discussion is necessary or permissible — a position so profoundly unscientific that it makes one gasp. And in fact, he used his veto as moderator of darkmission.net to suppress the following answer to marsandro's question. Adjustment of brightness, contrast, color balance, gamma. Correction of highlights, midtones and shadows independently. Correction of hue, saturation and lightness. Sharpening, edge enhancement, gaussian blurring. Despeckle, moiré removal, fade correction. ....and that's before you even think about the so-called "artistic" effects like posterization.